It is hard to imagine today but in the year 1500 Venice was the greatest power on the European continent. Founded in the fifth century by refugees seeking the protection of its lagoons from barbarian invaders, the city had become the leading commercial power in the Mediterranean world by the fifteenth century, especially after it had emerged victorious in its life and death struggle with archrival Genoa. Subsequently, Venice became much more than a sea power by gradually extending its dominion over the various cities in the surrounding mainland, the so-called Veneto. This process was largely completed by 1500 and Venice was even beginning to make incursions into the Papal States. In 1500 none of the other cities in Renaissance Italy could compare with Venice in wealth, military power, or political stability. Florence was mired in civil strife after the downfall of the Medici. Pope Alexander VI and his notorious son, Cesare Borgia, were attempting to regain control over the various warlords of the Papal States, but events were to show that their efforts were built on sand. The fall of the House of Sforza in Milan had made that city and Genoa puppets of the French monarchy. Even the Kingdom of Naples and Sicily was mired in conflict between French and Spanish claimants to the throne. At the same time France, Spain, England and Germany hardly existed as unified nations and were only beginning to be in a position to challenge Venice after a century of internal disorder and ruinous wars. Still suffering from the ravages of the Hundred Years War, the crafty Kings of France were contending with powerful local nobles while at the same time engaging in costly foreign adventures. In Spain, Ferdinand and Isabella had spent the first 30 years of their reigns subduing not only rebellious nobles but also eliminating the last vestiges of Moslem Granada. It would take decades before the discoveries following the voyage of Columbus would help refill the depleted treasuries of Castile and Aragon. England was no better off. The Hundred Years War had been followed by the Wars of the Roses, and although Henry VII was to prove a skillful and resourceful ruler, the success of his Tudor dynasty was by no means assured. Despite the presence of the Holy Roman Empire, the various German states, both large and small, were disorganized and relatively poor. In 1509 it took the combined forces of the Holy Roman Empire, the Kingdom of France, and the Papacy led by the warrior Pope Julius II to inflict a serious but only temporary defeat on Venice at the battle of Agnadello. Within a couple of years the Venetians had recouped most of their losses in the Veneto. By 1500 only the Ottoman Empire stood as a serious rival to the power of Venice. The conquest of Constantinople had finally brought an end to the last vestige of the Roman Empire, and established a secure foothold for the Sultan in Europe. Venice appeared to be the only state in Europe with the wealth and sea power necessary to resist further Moslem expansion. Although the Venetians seemed to prefer negotiations with the Infidel in order to safeguard their commercial interests, on occasion they did resort to military action to protect their overseas colonies. Historians can look back and mark the downfall of Venice in 1453 with the fall of Constantinople, or in 1492 with the discovery of the “New World” by Columbus, but in 1500 the hegemony of Venice in the Mediterranean world seemed secure. The great city-state had existed for over 1000 years, and it would survive as an independent entity for another 300. In 1500 Venice was not just a city, or even a city-state, it was a great island empire. 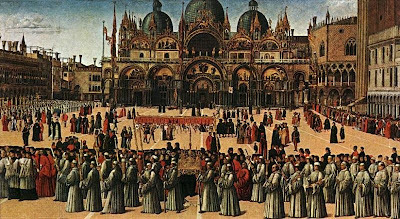 Contemporary commentators noted that the unique government of Venice provided the stability that lay behind its greatness. Venice was a republic and not a monarchy. The titles of King and Queen were forbidden in Venice. The Doge, the chief executive officer, was elected for life and the position was never hereditary. However, the position of Doge had all the trappings of monarchy. The Doge’s palace on St. Mark’s square was unrivalled in Europe. The ancient and magnificent Church of San Marco was the chapel of the Doge and not the cathedral of the Patriarch of Venice. In fact, only recently had the position of Bishop of Aquileia been elevated to that of Patriarch. Despite the exalted title the appointment of the Patriarch was in the hands of the Venetian government. More than any other country in Europe, the Venetian church was firmly controlled by the state. The Doge was chosen from the ranks of the patrician families that effectively ruled Venice. Although titles of nobility were also forbidden, Venetian patricians formed the most aristocratic class in all Europe. Unlike England, for example, where the King could elevate wealthy or powerful commoners to the ranks of the nobility, newcomers could not be added to the ranks of the patricians for any reason. In Venice wealth and military prowess were not sufficient to enter the ruling class. It was a closed caste. Positions in the Senate, the Venetian governing body, were reserved for patricians. Although socially inferior to the patrician class, a host of humanist scholars, scribes, and lawyers played a key role in serving the State and its rulers. Forbidden by law and custom to marry either above or below their caste, these ‘mandarins’ performed both actual and virtual service to the State. At the head of the humanist bureaucracy was the Grand Chancellor, the highest-ranking non-patrician in the government. In most cases his position was also a lifetime appointment. Other humanists served as legal advisors, scribes, and even diplomats. Their virtual service to the State was just as important. They were the writers and historians who used their classical learning to extol the greatness and the destiny of Venice. In other Renaissance centers humanists might place their own studies first and even challenge traditional culture and religious orthodoxy. But Venetian humanists, even those who came from abroad, placed themselves and their learning at the service of the State. The various merchant and manufacturing classes that made up the rest of the city’s population could be found in any other thriving medieval city, but no other city could match the wealth and prosperity of the Venetians. Venice was the Big Apple. The artists of the city were regarded as mere craftsmen and they belonged to the guild that represented house painters and wallpaper hangers. The steady demand for devotional images for both public and private use was being augmented as the new century opened by the increasing needs of wealthy patrons to fill their new palaces with beautiful works of art. Only at the turn of the century would the two Bellini brothers, Gentile and Giovanni, achieve independent fame and recognition. The correspondence of Isabella d’Este shows that Giovanni Bellini had become a kind of super star able to call his own shots and keep wealthy patrons in waiting. 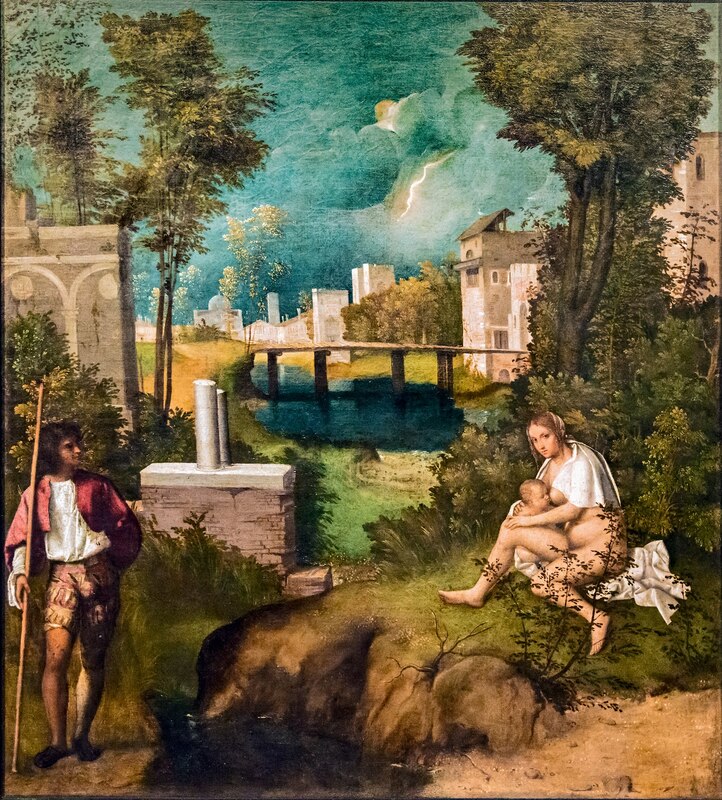 It was into this environment that Giorgione and Titian, two young artists from the Veneto, arrived in Venice to seek fame and fortune. 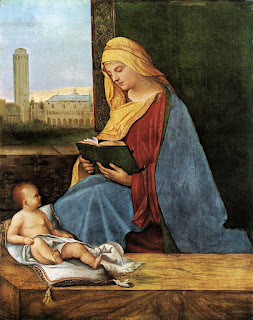 This little post is mainly to draw attention to David Orme's wonderful discussion at art-threads.co.uk of the artistic renderings in Renaissance Italy of the apocryphal legend of the Presentation of the Virgin. Titian's version above is perhaps the most famous but David reproduces some equally marvelous versions especially one by Tintoretto. He includes an explanation of the 15 steps so commonly used. Although Titian's version only seems to contain 13 steps, there are two more behind the priest at the top. 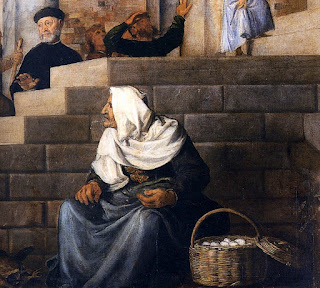 David's discussion of the Presentation is included in his section on the Life of the Virgin and Childhood of Jesus. I would like to take the opportunity, however, to put my own two cents in and offer a guess on the identity of the mysterious elderly woman so prominently depicted in the foreground sitting next to a basket of eggs in Titian's version. To my knowledge no one has so far been able to come up with a good explanation of this woman who does not even look at the young Virgin ascending the steps.